A long lasting livestock and premise spray that provides quick knockdown, broad spectrum insect control for up to 28 days. 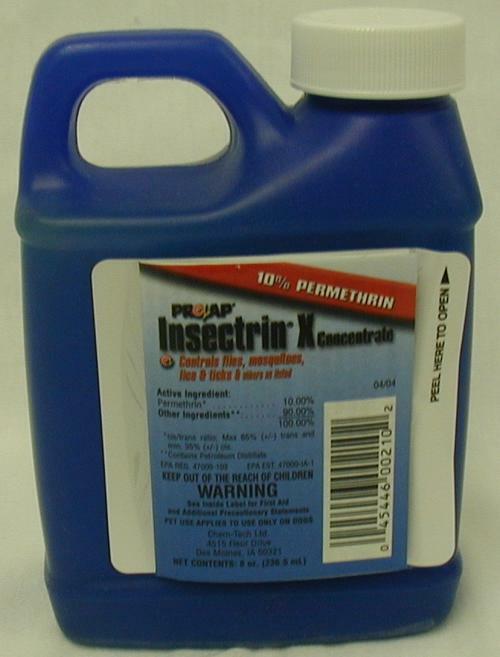 Active ingredient is Permethrin, a safe insectiside for use outdoors, in homes in non food areas, barns, coops, and kennels. Controls poultry lice, fowl mites, ticks, fleas, flies, and numerous other insects. This concentrated product, when mixed with water, will make 12.5 gallons of spray. 6 oz. Bottle.